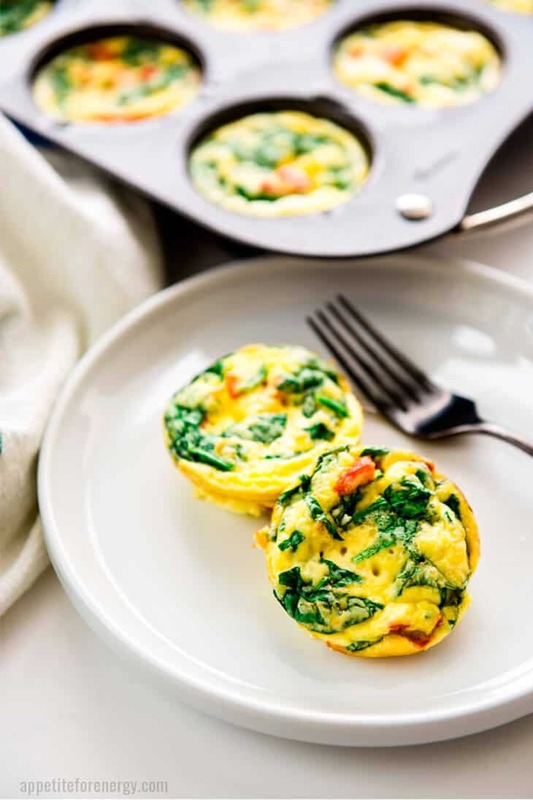 Smooth, creamy Spinach and Red Pepper Egg Bites baked to perfection, are incredibly versatile. Use this speedy recipe for a festive brunch, a healthy grab and go breakfast or for using up those holiday leftovers. Egg muffin cups are low-carb, keto friendly and gluten-free…so dig in! 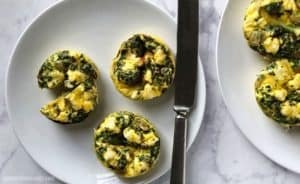 Egg bites, egg muffins, egg muffin cups and frittata muffins are one and the same thing. They are a mini-sized crustless quiche, and thefore ideal for those following low-carb, keto and gluten-free diets. This egg bites recipe is prepped and cooked in just 30-minutes, so works brilliantly for entertaining whether you’re hosting a breakfast or brunch. They can be prepped ahead of time too, and cooked closer to serving if you like to serve them warm. The recipe uses eggs, dairy and then a small selection of extras for a flavor burst. The extras can be anything from vegetables to cooked meats to cheese. It’s a great way to reinvent leftovers too. Why are Egg Muffins so Popular? You can use up leftovers (in a non-obvious way!) – veggies, meats (ham!! ), cheese! I hope you’re impressed because this really is one hard-working egg muffin! Make this recipe as a whole frittata rather than an egg muffin size: see our recipe for 30-minute Bacon & Leek Frittata for the method. Replace the bacon slices and leek with the equivalent amount of leftover meats, cheese or vegetables. The cooking tips below will give you some ideas on which leftovers to use. For another take on egg cups – check out our recipe for Spring Asparagus Frittata Muffins. 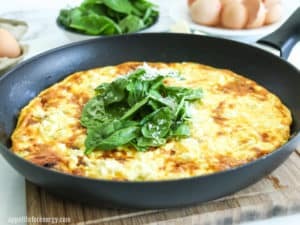 Remove egg bites from the oven and allow to cool slightly before serving. They can be served warm or at room temperature. How to remove the egg bites from the muffin tin? Use a knife to gently loosen the edges before removing from the tin. 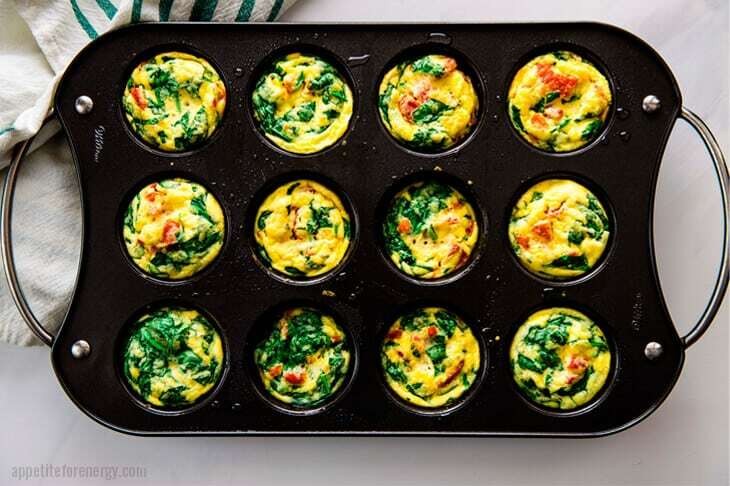 Can I add the peppers and spinach to the bottom of the muffin tins? Yes – an alternative way to make these is to place the solid ingredients in each muffin tin and pour the egg mixture over the top. Leftovers? 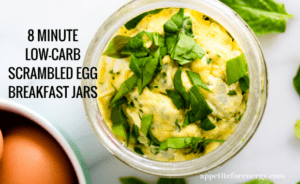 Store egg bites in a sealed container in the fridge for up to 5 days. Reheat in the microwave for 30 seconds. Can I freeze egg muffins? Yes, egg muffins freeze very well. Store in an airtight container and freeze. Defrost and then reheat in the microwave for 30 seconds or in the oven. You can also microwave from frozen. Taking egg muffin cups to a party? Take muffins along freshly cooked or from the fridge. They can be served at room temperature or warmed slightly in an oven. Entertaining guests? To serve these freshly cooked at a party: pre-prepare the egg mixture in the blender, add the peppers and spinach and store in the fridge. Prepare the muffin tins so they are ready. When ready to cook, simply pour the mixture into the muffin tin and bake for 20 minutes. No fresh spinach? Frozen spinach can be used. Be sure to squeeze out the excess water so the muffins don’t get soggy! Substitute ingredients? This recipe is vegetarian but it can easily be made with meats. The options are endless – instead of peppers (capsicum) and spinach, try leftover ham, cooked bacon bits, diced or cherry tomatoes, chopped asparagus, zucchini, mushroom or scallions, cheeses like feta, cheddar, mozzarella. HOW MANY CALORIES ARE IN EGG MUFFINS? 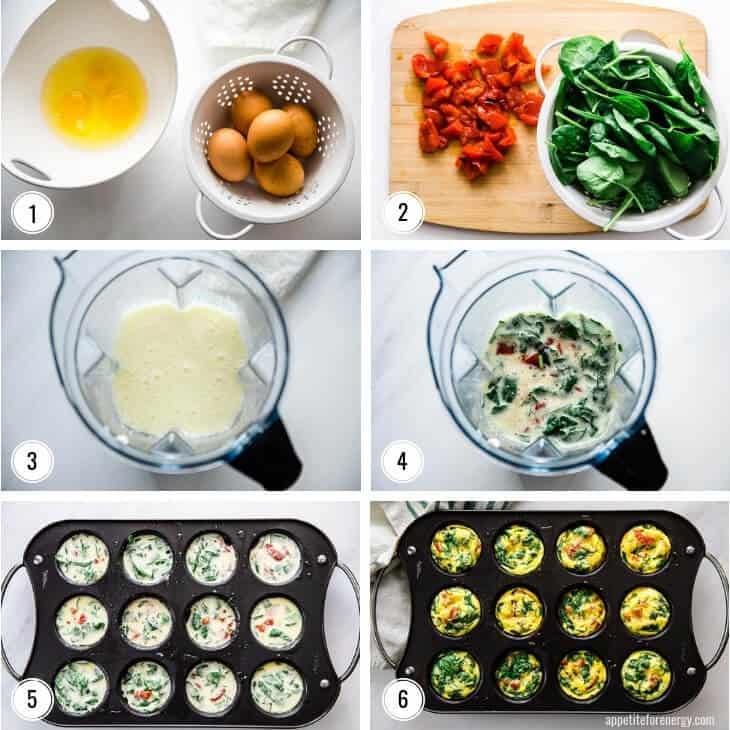 Egg muffins have 74 calories per muffin. They are a great snack if you are watching your calorie intake but looking for something healthy and filling. They are low in carbohydrates, contain eggs and usually some type of vegetables. Keep them in the fridge for up to 5 days and reheat for 30 seconds in the microwave to enjoy as a low-calorie snack or grab and go breakfast. Yes, egg muffins are made of healthy whole food ingredients including eggs, vegetables, and dairy. 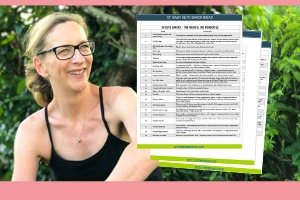 They are full of healthy protein, quality fats as well as being low-carb and sugar-free. They are a healthy choice for breakfast, lunch or as a snack. 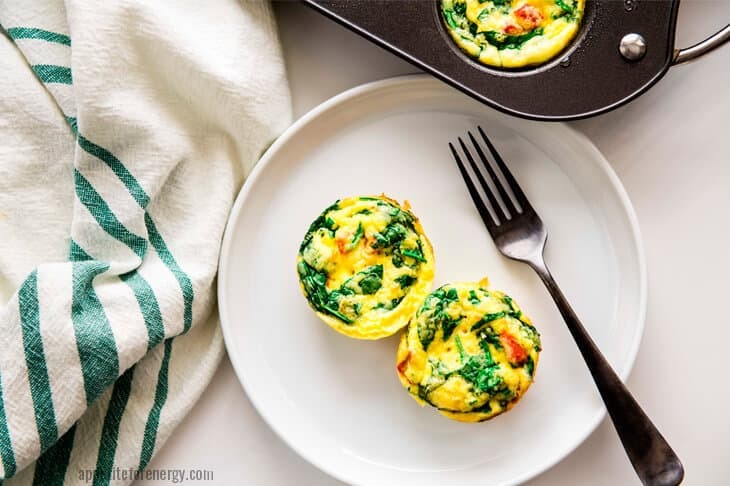 Egg muffins are the perfect multitasking recipe too – serve them as an easy but very popular entertaining dish, make a batch as meal prep for the next few days or use up your leftovers. 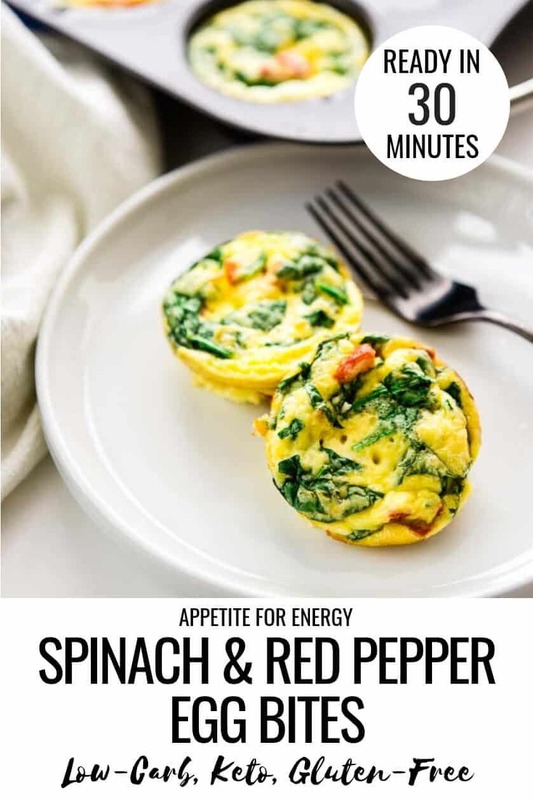 Smooth, creamy Spinach and Red Pepper Egg Bites baked to perfection, are incredibly versatile. Use this speedy recipe for a festive brunch, a healthy grab and go breakfast or for using up those holiday leftovers. 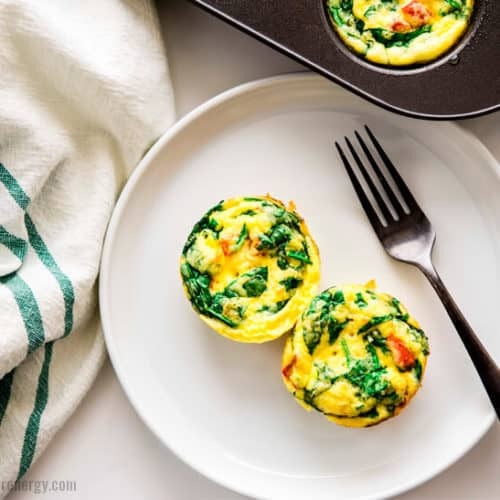 Egg muffin cups are low-carb, keto friendly and gluten-free...so dig in! Freeze egg muffins? Store in an airtight container and freeze. Defrost and then reheat in the microwave for 30 seconds or in the oven. You can also microwave from frozen. Substitute ingredients? 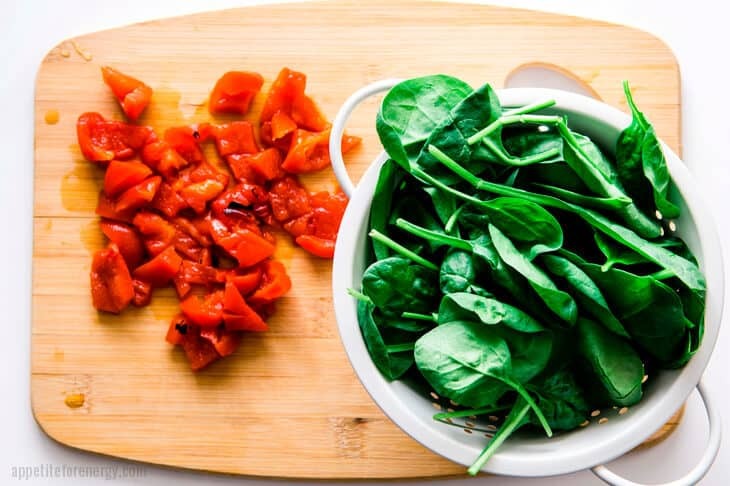 Instead of peppers (capsicum) and spinach, try leftover ham, cooked bacon bits, diced or cherry tomatoes, chopped asparagus, zucchini, mushroom or scallions, cheeses like feta, cheddar, mozzarella.